The 5th International Stewards’ Conference was conducted today, 5 May, at Happy Valley Racecourse in Hong Kong, in conjunction with the 35th Asian Racing Conference. Chaired by Mr. Kim Kelly, the Hong Kong Jockey Club’s Chief Stipendiary Steward, the conference was attended by 71 delegates representing 28 racing jurisdictions. Kim Kelly, Chief Stipendiary Steward of the Hong Kong Jockey Club (right), chairs the International Stewards’ Conference today. 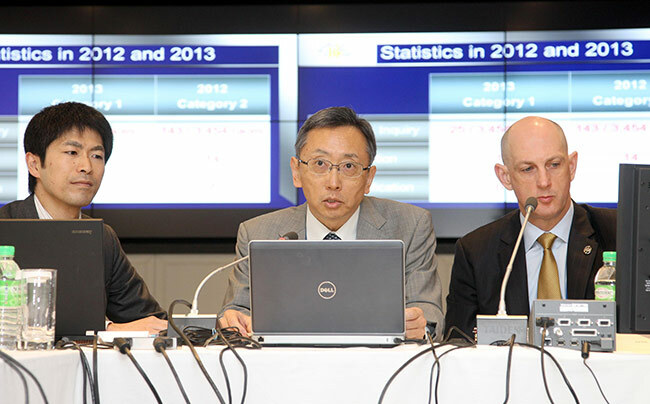 Yoshihiro Nakamura, Chief Steward of the Japan Racing Association (centre), also presents a report in the session. One of horseracing’s most important Rules is the protest/objection Rule, which until relatively recently was operated in several different ways around the world. 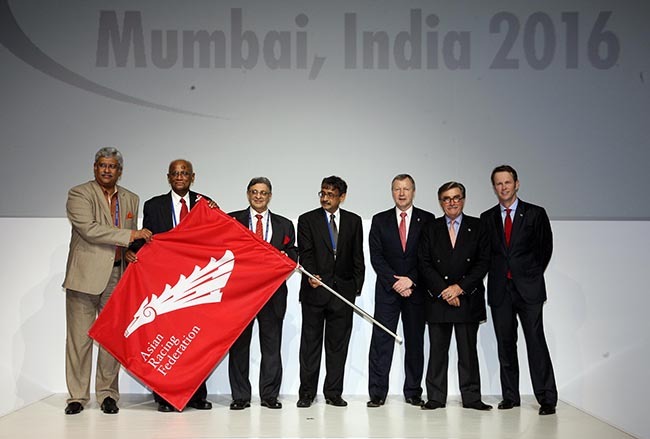 This issue was highlighted at the 31st Asian Racing Conference in Dubai in 2007, since when great progress has been made to harmonise the Rule internationally, thanks to discussions held during previous International Stewards’ Conferences and meetings of the IFHA’s International Harmonisation ofRaceday Rules Committee. There was further welcome news on that front at the Stewards’ Conference today, when Mr Yoshihiro Nakamura, Chief Steward of the Japan Racing Association informed delegates of the results of a change to the protest/objection Rules in Japan that had taken place in 2013. The JRA had changed to the ‘Category 1’ philosophy which is widely used throughout Asia, Australasia, Great Britain, India, Ireland and South Africa. Mr Nakamura reported that in 2012, there were 142 protest/objection inquiries conducted, with a change to the judge’s placings being made on 21 occasions. Of these 21 instances, 7 horses were disqualified as a result of being found to have caused interference which affected the result of the race, irrespective of where in the field the offending horse finished. By contrast, during 2013 there were just 25 inquiries with only one change to the result of a race. Further, there were no horses disqualified from a race for having caused interference. Against the background of events in various parts of the racing world over the past few months, another significant discussion at the Conference was held on the subject of the level of penalties that should be applied to serious offences, including the use of anabolic steroids and issues relating to animal welfare. On that subject, the Conference was pleased to note a report from Mr Johan Petzer, Chairman of Stewards at Thoroughbred Racing South Australia, concerning the introduction in Australia of mandatory minimum penalties relating to offences involving prohibited substances and animal welfare. Looking towards the increasing internationalisation of racing, further presentations examined: the possibility for protest/objection hearings being conducted in a harmonised manner around the world; and the merits of having jurisdictional gear/equipment registers to assist connections given the ever increasing movement of racehorses between countries.